Progressive BlackJack - Claim a Massive Jackpot by Playing This Game! If you’re familiar with progressive jackpots and actually are a fan of these, you’ll certainly enjoy playing Progressive BlackJack – the popular game of 21, but with an added payout and a quite massive one. 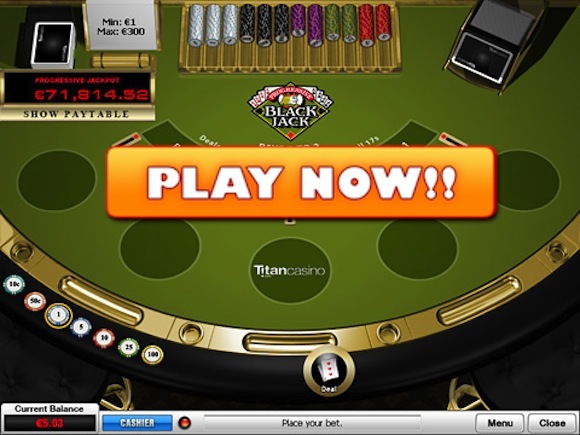 This game, altogether with the progressive payout, is pooled across all casino sites that are powered by PlayTech software. What does this mean? Well, countless players are playing at once and building up a massive jackpot pool. Actually exactly 3% from every wager that is made on the progressive bet goes to the prize pool of it. 3 Suited Aces – 5,000x your jackpot sidebet wager amount. 4 Aces – 2,500x your jackpot sidebet wager amount. 3 Aces – 250x your jackpot sidebet wager amount. 2 Suited Aces – 100x your jackpot sidebet wager amount. 2 Aces – 50x your jackpot sidebet wager amount. 1 Ace – 5x your jackpot sidebet wager amount. So you probably are aware of the fact that you have to make a sidebet to win the progressive payout. This is done by choosing a chip denomination and placing it on the ticking red light, which will place a wager on there right away! Apart from that, all you have to do is get a hand that consists of 4 suited aced dealt. If this does happen, you’ll walk away with a little over $60,000, which is the current amount of the progressive payout. I’m pretty sure that I’ve seen Progressive BlackJack offered at many casinos, including Cryptologic Powered ones, but this review is tailored towards the one that can be played at Bet365 and Winner Casino – powered by PlayTech. Bonus wise, you’ll be able to claim either a standard opening bonus of $100 or a VIP one. The latter features a lower match (50%), but has a higher cash amount attached – $500. There also is a loyalty program, which will bring you constant cash flow straight into account, as long as you play games for real money. Winner Casino, on the other hand, is a relative newcorner, but after trying it out I have no issues with recommending it. New players would actually benefit from playing here instead of Bet365, as Winner awards each new player, who signs up for an account, a free gift of $/£30. You can use this money to play all their games for real money or bet on sports, that’s completely up to you! Other than that, there also are 3 welcome bonus packages, tailored towards the most popular player types – beginner, midroller and highroller. The latter bonus is quite generous, adding up to $2,000 in cash straight into your account, once you’ve made a deposit. $30 No Deposit Bonus – Try This Game Free! Copyright © 2011 -2014 - CasinoCardGames.net. All rights reserved.